Never one to do things the easy way, I wanted to put some nice timber on the arse end transom of my boat. I'm really liking Jarrah, for its warmth, durability, and absolute pigheadedness. Unfortunately I couldn't find Jarrah in thin planks to use as a veneer locally, so had to make do with 20mm thick stuff. Here's the first couple of planks, having been planed accurately flat on edge and glued together. Now that I was working on the transom, Mogget lost interest in the rowing thwart, so I had an opportunity to take a photo. Cool, huh? I rounded the edges over with a 6mm round over bit, making them easy to work with and comfy to sit on. Once the four planks for the transom veneer were joined edgewise, I planed the back flat, and mixed up an enormous batch of epoxy, which I slathered on both the Jarrah planking and some 6mm ply. While it was setting up, I put as much weight on it as I could conveniently do. Barrett Faneuf was all fancy with her transom, and used a saw to cut the planks edgewise into thin slices. I have no saw. What I do have (thanks Dai!) is a thumping big router with a 25mm bit, a huge hand plane, and a whole lot of stupidity enthusiasm. After a couple of days of going at it with the router, I had a really rough surface approximately 6mm thick, which I could then plane smooth. This I did with my awesome English Stanley no. 7, the smootherator. So then I cut my veneered ply out into a transom shape, and sanded out some minor diggage from the plane. One of the things that makes Jarrah so strong is that the grain goes all over the place. So the plane tends to dig in a little, even when it's set for a really fine cut and extra sharp. To celebrate, I applied a quick coat of epoxy. It's protective, honest. Doesn't that look nice. Actually seriously the epoxy is a barrier to ensure no grey silica gets into the grain, hopefully meaning there's less sanding needed on the transom once the planking is done. Building the doubler out of Tasmanian Oak took longer than building the transom itself. Much work with the tenon saw and chisels. One advantage to having really sharp chisels is that when you cut yourself, they make a lovely clean cut, with no bruising or jagged edges. Said cut heals much quicker and neater than a cut from a blunt chisel. Putting the doubler on the transom gave me another opportunity to use all my clamps at once. Here's a test fit of the transom on the arse end of the boat. Look ma, no clamps! And finally here's a view from the rowing thwart, all glued up. I used some rope to pull it forward towards bulkhead 8, seating it positively against the back of the cockpit seats. A couple of clamps pull it downward into the floor, and a final spreader clamp ensures the cockpit seat fronts are properly seated. The astute will note there's nothing between the two sides of bulkhead 8. It's a deliberate deviation from plan, along with ditching most of the bits between the two sides of bulkheads 5 and 6. I worked out that if I ditch the back of the cockpit seats, there's enough space on the floor for me to lay out my sleeping bag and sleep. Not dreadfully comfortably, mind, as there's not a huge amount of space down the side of the centerboard case, but certainly doable. 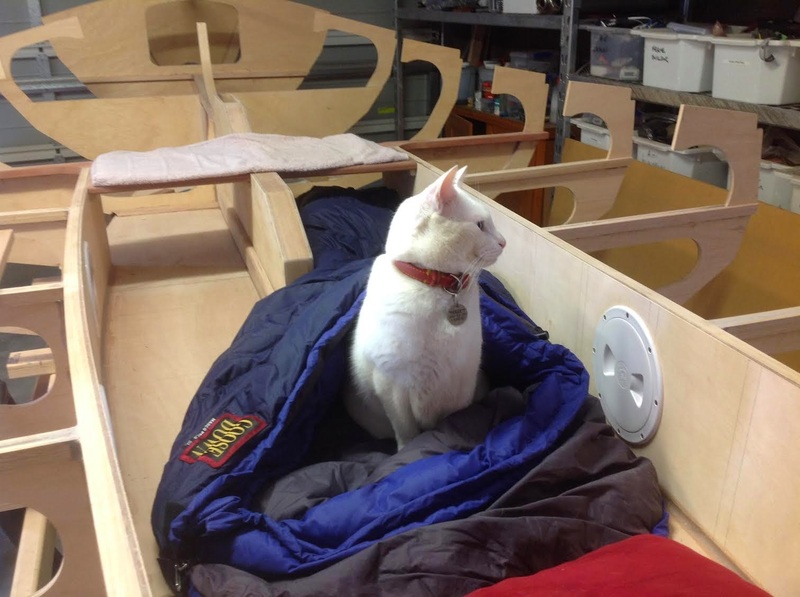 Here's a test fit of my sleeping bag on the floor of the boat, complete with cat (and you thought you were going to read a whole blog post without a picture of my cat). Here's a pro tip. If the cat goes deep into the sleeping bag and his eyes turn completely black, it means he's about to kill you. Beautiful transom! Love that grain. Well done. I really like your clever modifications to this beautiful design. Well done!